Printed illustration of the funeral ceremony of Princess Charlotte in St George’s Chapel, 19 November 1817. Published by W.H. Pyne and R. Ackerman of London. 6 November 2017 marks the two-hundredth anniversary of the death of Princess Charlotte Augusta of Wales. She was the daughter of the Prince of Wales, later George IV, and at the time of her unexpected and tragic death she was the only legitimate grandchild of the monarch, King George III. Princess Charlotte had been a very popular public figure, her reputation enhanced by the failing health of the king and the often inappropriate and irresponsible behaviour of his son, her father. Her death in childbirth at the age of twenty-one not only deprived the country of its second in line to the throne, but also caused deep national mourning for the loss of a lively and well-loved young woman. 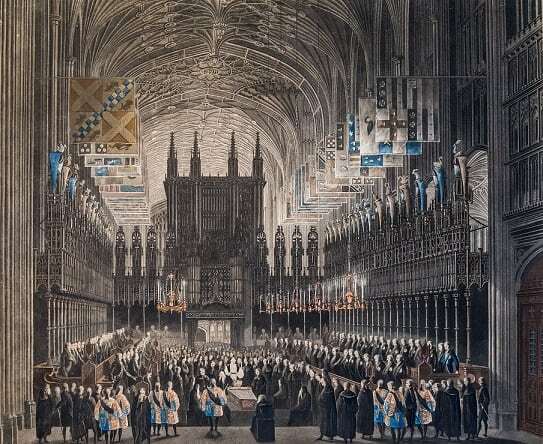 The funeral for the Princess was held in St George’s Chapel on 19 November 1817. Afterwards, she was buried in the Royal Vault with the body of her son – who had been still-born – alongside her. The service is depicted in this engraving from St George’s Chapel Archives [SGC F.46]. It was attended by huge numbers of people; the Quire became so crowded that some members of the ceremonial procession had to be denied access. There were disputes about who should be allowed to sit in the Garter Knights’ stalls and some who had acquired much sought-after public tickets to observe the service from the organ loft were not able to gain entry to the Chapel. Numerous complaints were received afterwards from people who had been unfavourably seated or whose view had been restricted. Dean Henry Hobart defended himself and his colleagues in a written statement, explaining that as soon as they had known the date of the funeral they had met daily to make the arrangements for the service and to ensure that it was properly and decently performed. This statement [SGC X.24/1] can currently be seen in the exhibition in the South Quire Aisle, Commemoration and Celebration: Princess Charlotte, Queen Victoria and Prince Albert. In contrast to the public desperation to be present for the Princess’s funeral, neither of her parents attempted to attend the service. Prince George, The Prince Regent, and his estranged wife, Princess Caroline of Brunswick, were both too distraught at the untimely loss of their only daughter. As an expression of the nation’s grief, a memorial was commissioned and paid for by members of the public, with individual subscriptions limited to one guinea each. Sculptor Matthew Coates Wyatt designed a moving memorial depicting the ascent of Princess Charlotte and her child to heaven. In 1824 this memorial was installed in the Urswick Chantry Chapel, in the north-west corner of St George’s Chapel, where it can still be seen today. 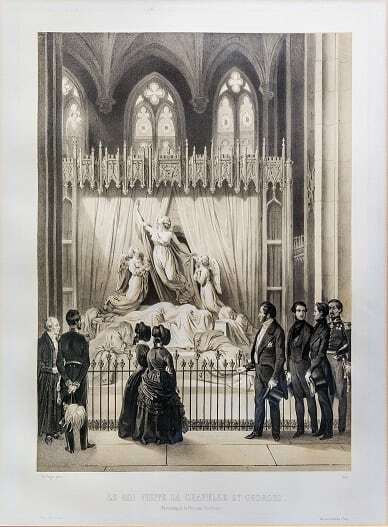 The drawing below shows Louis Philippe, King of France, paying his respects at the memorial during a visit to Windsor in 1844 [SGC F.237]. Lithograph from a drawing by Edouard Pingret depicting Louis Philippe, King of France, during his visit to St George’s Chapel in 1844. Printed by Lemercier, Paris. Princess Charlotte’s death caused a succession crisis for the British monarchy, as she had been the only legitimate child born to George III’s twelve surviving children. The king’s sons now rushed to marry and produce an heir. In 1819 a daughter was born to Edward Duke of Kent, George III’s fourth son, who in 1837 would be crowned Queen Victoria.